Lincoln County Resource Teacher Ruth McDonald set down her phone and exclaimed “The Bottom Feeders are on a seismic research vessel! They won’t make it back for this activity.” I glanced at the empty table in our workshop room and responded, “That’s great!” It didn’t really sound like they needed a tutorial on offline research. Afterall, they were in the midst of talking to a scientist aboard a research vessel. In case you’re imagining a group of bottom feeding leeches infesting a research vessel, I'll clarify by explaining that The Bottom Feeders were just one of several teams participating in an Oregon Coast workshop in early February. Other team names included The Jumbo Shrimp, Sole Train, and Not Hootie’s Blowfish. But, let’s back up a bit. When this occurred on February 8th, a group of 60 Lincoln County teachers, media assistants, mentors, and principals were all gathered together for a two-day Model Classroom professional development workshop at the Oregon Coast Aquarium. This experience is part of a larger project called Project SEAL. SEAL stands for Students Engaged in Authentic Literacy. It is a 2-year Innovative Approaches to Literacy Grant funded by the U.S. Department of Education for the students and staff of the Lincoln County School District (LCSD). The overarching goal of the project is that LCSD school libraries and classrooms will form a connected, “21st Century Learning Environment” that “enables students to learn in relevant, real world 21st century contexts (e.g., through project-based or other applied work) and allows equitable access to quality learning tools, technologies and resources. According to Doug Hoffman, Project Director, “ Project Seal will ensure that library resources for students, instructional strategies employed by teachers, materials and technology support teachers in helping students meet the Common Core State Standards (CCSS). 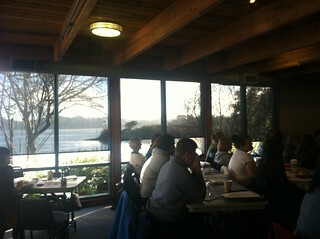 During the first workshop day at the Oregon Coast Aquarium, smaller teams of educators were challenged to complete two connected challenges. The first challenge asked the participants to identify local examples of a global issue (for example, the local forestry industry as an example of the larger global issue of sustainable economic development), then form a hypothesis on that issue by conducting research with local community members, experts and other resources. The second connected challenge asked teachers to find ways to engage youth in taking action on that same issue. The goal of these collaborative challenges was to give the educators first-hand experience of being a student working in a team to investigate, discuss, and address a real problem. This firsthand experience allows teachers to think about what would happen if they asked their students to solve an open-ended and complex local problem. Through that experience, educators have time to collaborate with peers, flex their creative muscles, and figure out how to problem-solve using a variety of strategies and tools (for example, research skills and technological tools). This process allows teachers time to think, experience, then apply it to their own practice. 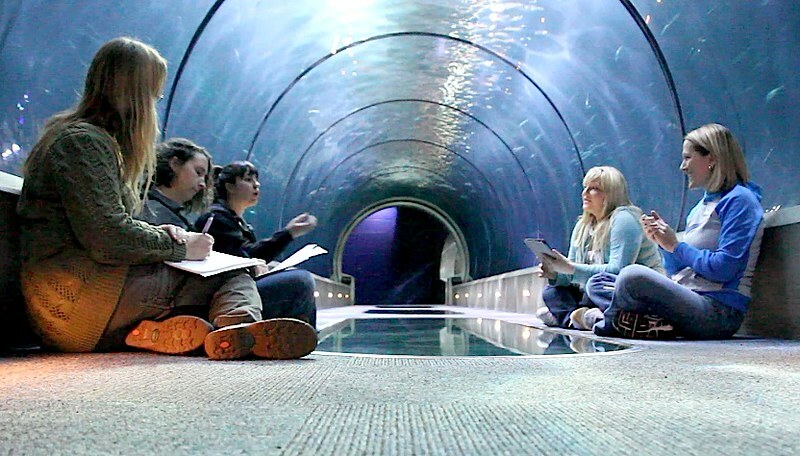 Teachers brainstorm ideas for their local issue in the Oregon Coast Aquarium shark tank. "The most inspiring and motivating part of the PD was going through the same steps my students would go through. As I went through the activity, going through the process of working with a team to address a local issue, I thought to myself, ‘I can do this with my students and they would love it!’ It was really interesting to hear all the different ideas that were based on the diverse backgrounds of my team members. Identifying our issue was fun. The dialog was creative, passionate, and constructive. You could tell when we had chosen our issue, because everyone was excited and motivated to explore our topic and become experts. 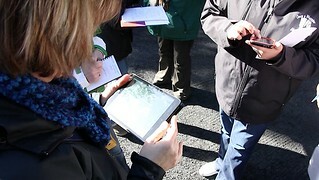 Reaching out into the community to do research was very fascinating. Hearing the different sides of our issue and exploring outcomes made me feel connected to our topic and the community." While the first workshop day was about getting out into the community to explore the possibilities of real local connections, the second day took place at the Newport Intermediate School and addressed how teachers could bring these practices back to school. Throughout the day participants were asked to work closely with their school teams as they examined several topics and challenges including 21st century literacy, school space, and authentic technology integration. One key challenge expanded on the first day’s challenge, but made it even more local. How could a space within school represent challenges and opportunities for students to explore? In their teams, teachers selected from one of the following spaces: classroom, library, computer lab, multipurpose room, playground, or hallway. They first did a thorough documentation and description of the space. Then, they used this detailed look to ask questions about the space’s potential for 21st century learning opportunities. A team of teacher mentors exploring the hallway space observed that the hallways were very blank, and that they only utilized wall space. As they moved into asking questions about the space, they wondered how the hallways might facilitate collaboration and problem-solving among students. They wondered how the floors might be used to inspire kids to think about various topics of interest. In the meantime, a team of kindergarten teachers from Sam Case Elementary explored the school playground. As they discussed opportunities there, the conversation naturally shifted to their own playground. Teachers Jillian Becker and Kim Haddon explained that their playground has the benefit of backing up to two of the three Kindergarten classrooms. Despite this, they feel the mainly concrete space is not inviting to the kids. They realized that they want the space to become an extension of the classroom as well as a space the students can take ownership for. The team discussed how this space presented an opprotunity and a problem for their young students to tackle. Could they begin the process by asking the students what they wanted from a playspace, outdoor space, and learning space? Could they identify local partners- like artists and garden centers- who might work with the students on redesigning the space? "The difficult part was trying to figure out, what the students could do at the school to engage the topic? We need them to go outside of just consuming information, but to process and produce information. We had some good ideas, but when pushed to dig deeper, it became difficult to narrow down the idea. As a teacher you always have classroom logistics rolling around in your head, but that is part of the challenge that pushes you to think more creatively." The educators involved have been challenged to identify a specific goal they’d like to work towards, then devise and implement a classroom test for this goal. After they run their classroom “test,” they share what happened with the larger group within a community Google Site. The goal of these smaller tests is to help us identify the smaller practices required to carry out projects that give kids real, relevant, and impactful experiences. With that said, many Project SEAL educators are working towards the bigger picture by implementing all these smaller practices-- student-driven learning, real-world challenges, authentic technology integration, and 21st century skills-- within a larger challenge-based project. The Sam Case Elementary teachers will begin their playground redesign challenge this week by challenging students to investigate their current playground and develop a list of ideas for improvement. At the same time, students at Crestview Heights Elementary will begin a variety of investigations related to ocean life and debris. For example, the challenge for Special Education students will be to develop an action plan for ocean debris in their local community. The inquiry based learning was a huge takeaway for me. Since the weekend of professional development, we have started a mission and vision team with teachers and staff who are collaborating to create a mission and vision for our school. We started with the question: "What are we about?" It is our goal that these meetings will result in a clearly defined, aligned, and realistic mission and vision for our school that points us in the direction we need to go. As we explore this together, we’ll be building and sharing examples and ideas. Please stay tuned for featured practices, featured projects, and the building of an educator strategy kit! Ruth McDonald proposed Project SEAL after attending the “Mission Possible” summer 2012 workshop at the National Portrait Gallery and Smithsonian American Art Museum. “While attending,” she says, “I realized the Model Classroom fit perfectly with my district’s focus on using authentic, contextual learning revolving around local issues and Ocean Literacy.” She was inspired to develop an Innovative Approaches to Literacy federal grant incorporating 21st Century literacy skills, digital tools, and challenge based learning into the proposal. Through Project SEAL participating teachers receive an iPad mini to learn to incorporate digital literacy and tools into instruction, each of the 10 district school libraries will have a mobile cart of 20-40 iPad minis, new ocean literacy library books and resources, and 30 hours of in-person and online professional development from the Pearson Foundation Model Classroom trainers. Thank you for writing such a wonderful article about LCSD. We are so fortunate to have gotten the grant, and more...to have partnered with the Model Classroom and Pearson!